LAKELAND – Some of the greatest forehands, backhands and serves in the sport will be on display as the second to last table tennis tournament of the season takes place at the Simpson Park Community Center this Saturday starting at 9 a.m.
Also on-hand will be representatives of USA Table Tennis (USATT), as they not only promote the sport but highlight the upcoming U.S. Open Championships to be held in Orlando Dec. 16-22. But before the best of the best go to Orlando, players wishing to get to that level will play in Lakeland Saturday at The Florida Orange Blossom Table Tennis Series Colossal Round Robin, a USATT sanctioned tournament. Eleven players in each class participate during a full tournament. Additionally, Friday night event will feature three separate contests. 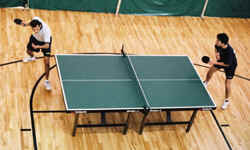 One event will be a United States Sandpaper Table Tennis Association (USSTTA) sanctioned tournament, where players will use old-style sandpaper covered paddles, as well as a Super Big Ball Table Tennis Association (SBBTTA) sanctioned tournament, where players use a ball that is 10 percent larger than the standard ball. Additionally, a championship doubles tournament has also been added. Awards and trophies for Friday’s contests will be awarded that night. For more information visit www.floridatt.com/lakelandtt/news.php.